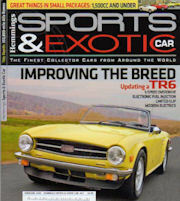 Hemmings Sports & Exotic Car Magazine!!!!!!!!!! For Sale...........and all made by me! Check out theTR6 & MGB Fender Blankets I'm now making and selling along with Interior Panel kits and Boot Covers. At some point I'll set up a separate site for these items but for now just follow the links or email me for more information. Six-Tech Manuals and are available for download here........... We've just added the Hub Manual for download from the same link as the Six-Tech Manuals. The list below is dedicated to the entrepreneurial Triumph owners who have developed and are manufacturing parts that make our cars more reliable. These people never cease to amaze me with their creativity. If you've created a needed component, please email and tell me about it. This is not intended to be a list of Parts Suppliers e.g. Moss or TRF. Those folks can be found further down on the page. Don't forget to check the British Motor Trade Association too for additional suppliers. Mr Mike does custom Miata seat covers in your choice of material and color. He'll also sell matching vinyl so my Interior Panel Kits will match your seats. Jeff Palya rebuilds Carbs to a new standard. Beautiful, custom wood dashes from California. Handcrafted by Randy Keller and well worth the wait. Top quality instrument calibration, restoration and conversions.... ask for Morris. valve cover gasket. Three years on my car with no leaks! Richard Good makes lots of "Good Parts" for Triumphs. Considered by many to be the best parts supplier today. Just make sure they have the part in stock. Want To Buy Or Sell A Triumph?